This is the story of Ishtar. Ishtar's magic was that she learned to tell time. A leap of imagination that linked the past present and future. Her cycle is like the moon's, quite a coincidence or not. The primordial Eve, Isis, Venus, Persephone kept track of the skies and her own cycles and began recording them. She observed and marked down the goings on of her surroundings and her spacial and special relationship to them. I say she because after all our common mother is by some accounts 50,000 years older than Adam. She collects beads and strings them. Her time keeping counting device is now a bracelet. Perhaps it is the model on which the abacus is based. Beaded bracelets are still used around the world today as a very effective form of contraception. Her knowledge was indeed how to bear fruit and how not to! She penned animals and they bore fruit and the grasses and trees did too. That knowledge allowed man to cover the ends of the earth and conquer all that he saw. The populations grew exponentially and more was required to feed the growing numbers of humans. We were most likely penning animals and planting crops for so long and so intensively that environmentally we could no longer recover from the cyclical droughts and deluge. The flood story we all keep talking about has probably happened over and over again. The boxing day tragedy of Indonesia was most certainly of biblical proportions to them. I do not think Malthus was painting a picture of a bleak future doom, I think he was telling an old story. As resources grew scarcer battles ensued to procure and protect dwindling arable lands and trade routes. The goddess mother's way of life was no longer relevant. Old networks based on trade and commerce crumbled. The warrior was now required with his brute strength and technological advances in war to defend the precious lands. The last of her kind was burned at the stake, and now only Buddha, Allah, Brahma, and Jesus are left; no girls on the stage of modern deities. 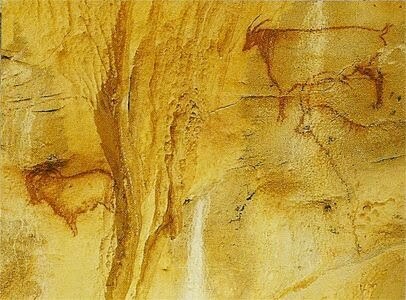 This is a piece discovered if Africa. I'm not proposing to decipher what was intended by the maker, I include it only to highlight it's age, believed to be around 20,000 years old. This is a modern contraceptive bracelet. It works by counting the days of a woman's cycle and tracking when ovulation occurs. This works as both a fertility bracelet and a contraceptive. Even today it proves to be as effective if not more so compared to modern methods of birth control. Venus figurines have been sculpted throughout the world for many thousands of years. 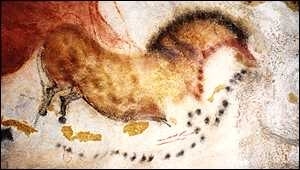 Some interpretations of this painting relate the black dots encircling the horse to the lunar cycle. Maybe, just maybe, these were the first maps and instructional manuals. They could tell us where and when to find herds of migratory animals. 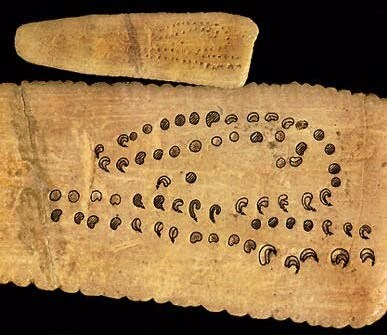 Below we can see lines etched onto a mammoth tusk; wood, stones,beads, shells, bone and cave walls have all been found with these enigmatic markings. These animals look as though they are being herded or squeezed between two geographical features. Some of the paintings may be a message as simple as how to get lunch. Perhaps they were intended for future generations and or traders as instructional guides. Knowledge of animal migrations would have been an invaluable thing to leave to the next generations. cleverly drawn below. 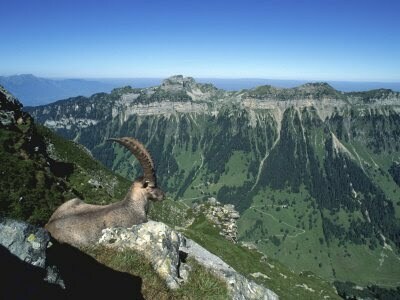 The ibex have changed very little and still live on steep slopes today. What was once a means of conveying hunting and herding information begins to morph. Now on the canvasses, we see the same technology and skills humans once used to hunt animals being used against each other. It's important to note here the image of the boat in the lower right hand side. This image is found also throughout the world. Here is another battle scene painted with much more care to detail. 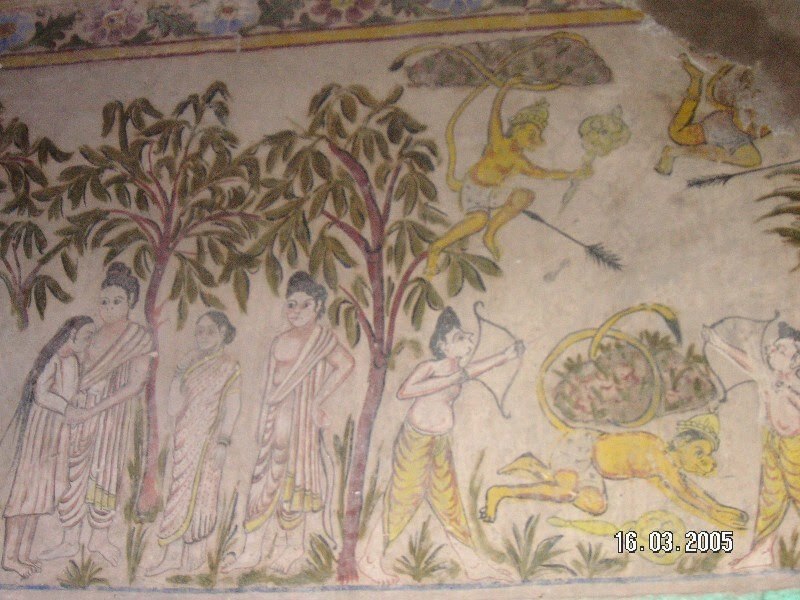 Observe the monkey flying out of range of the arrows, he looks as if he could be holding a rather large stone. The monkey at the bottom is shielded by a large mound of earth and grass. Is this a possible depiction of a menhir and doleman and their actual use? 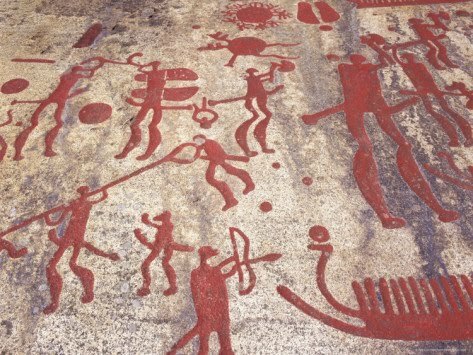 Here you can find comprehensive well organized examples of rock art throughout the ages.